It had been a long time coming. Since the first meeting of the High Level Panel, set up by Ban Ki Moon and co-chaired by the British, Liberian and Indonesian Heads of State in New York the massed ranks of civil society had been looking forward to this meeting with expectations and anxiety in equal measure. Expectations were high of a genuine dialogue and opportunity to reshape the path out of extreme poverty with people at its centre, while anxieties were heightened by the prospect of politicians reverting to type and stymieing the process in the search for a bland compromise that everyone could live with. 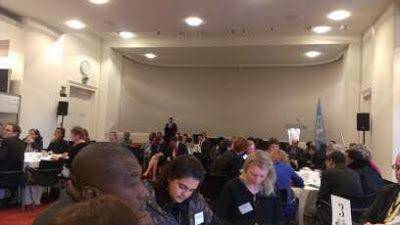 Those of us lucky enough to have been asked to take part in the dialogue with the High Level Panel members through the Beyond 2015 campaign met wider civil society the day before, and it was already very clear indeed that there were some very impressive voices to be heard. Leaders of the disability movement from South Africa, the climate change campaign from Bangladesh and the grassroots Niger Delta Women's movement for Peace and Development were among them. Surely the Panel members had to be struck by the power of the arguments they advanced? On the day, the session for civil society was the second of three outreach events and our trepidation wasn’t helped by the sight of the first lot coming out in super sharp suits and uber confident smiles. Yes, it was the business folk who’d come to pow-wow over a power-breakfast, get down to the bottom line and seal the deal with the panel. Business has a vital role to play and it was absolutely right they were there, but they have a very different way of doing things, those folk from the City. And we had to follow them. So with some nerves in we went and for the next 90 minutes our faith in the process, I think, was very much reinforced. It became immediately obvious that these Panel members genuinely wanted to rise to the challenge that they’d been set: find a way forward that delivers on the goal first outlined in 2000: of ending poverty in our time. They listened and genuinely engaged, among them Graca Machel, a former Mozambican education minister and advocate for the rights of southern African women and children, who herself had some challenging words for us. Keep up the pressure, she said, but look to yourselves too. We could not expect, she argued, to be taken seriously if we couldn’t demonstrate as civil society that we genuinely represented our constituencies and managed to construct a single coherent narrative from within ourselves. The Panel, who by and large mix in high circles generally, were confronted by some uncomfortable truths from the ground. No, we didn’t need a “social floor”, whatever that jargon means, said the woman from the Niger Delta, responding to a Panel member's suggestion. It’s quite straightforward – we need insurance, just like any other business, as she described how a group of women in her community had received micro credit loans to start fish farming businesses. But a recent flood had destroyed the fish farms leaving them with no assets but a mountain of debt. Pencils were sharpened and notes were made. It was one of many references to climate change throughout the day. Our discussions were over too soon, of course, and off we trooped for lunch which was cleverly procured by those bods at Development Initiatives who’d hired a room in the Institute of Directors next door. 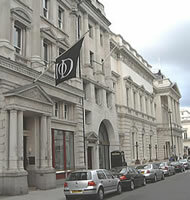 The irony of discussing extreme poverty over prawn sandwiches in the plush surroundings of the IoD was not lost, but it was a good chance to debrief, and the mood among us was really positive. We were actually getting somewhere with these guys. The youth were the next bunch in, and by all accounts they were seriously impressive too. But at 4pm things, in my view at least, started to go downhill. There was a town-hall style meeting, the idea of which was to allow members of the panel to hear direct from members of civil society who hadn’t been part of the earlier chunks of the day. And, frankly, I think we all rather let ourselves down. The Panel members were lined up in a row in front of the massed ranks of what must have been over 200 people, who'd been urged to tweet like there was no tomorrow, even having been issued with WiFi passes on the way in. Top blogger Duncan Green of Oxfam did a great job chairing the debate and managed to drill some discipline into the first exchanges. 15 seconds was your lot, he said, any more and you are effectively robbing someone else of the chance to speak. What followed, however, was two hours of mostly random single issue mini and not-so-mini speeches with each speech maker, in some cases reading from a pre-prepared script, underlining how their own issue was the single most important thing of all and really must be seen as such, you know. 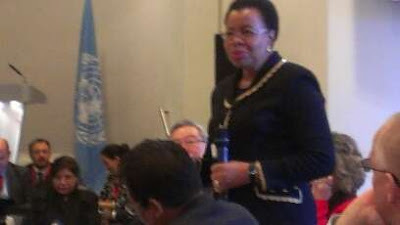 This prompted Graca Machel to re-iterate her plea for coherence and discipline – “I am you” she said standing from her chair, referring to her own civil society status, “but you must help us”. The message was that we were definitely not helping by this sort of approach. What we needed was a ”package” and civil society had to help, not hinder that work. Having completed this oration she promptly announced she had a plane to catch and left the stage, still telling us to behave ourselves, as an unfortunate aide tried to disentangle her from the microphone cable on her lapel, nearly falling over in the process. Quite an exit. This was also the message from Yemeni Nobel Peace Prize Laureate Tawakkul Karman, a fearsomely impressive young woman, who has fought for human rights and social justice in the context of highly conservative Yemen, and the “war on terror” being prosecuted all around her. I would imagine she doesn't take fright too easily. We had to keep up the pressure, yes, she said – but we also had to help the panel, not pepper them with a very long shopping list. Yet this was immediately followed by one gentleman who treated us to a long and winding speech, which seemed to be punctuated by regular name checks for his organisation. Oh dear. Towards the end however, my own faith was renewed by one young man from Sierra Leone. He had no interest in long speeches, nor name checking anyone or anything. He was a former child soldier who had been forced to do terrible things, he said. Kidnapped at a very young age during the waves of civil war, that was his reality. That had been his childhood. By now he was speaking to a silent hall, as he looked at the Panel members and told them calmly that if they produced a framework that again missed the likes of people like him as the MDGs had, the world would never forgive them. And then promptly sat down. Clearly moved, former Clinton Chief of Staff John Podesta, responded that missing people like him had been one of the biggest errors of the previous framework, and that it couldn't be allowed to happen again. That is the scale of the challenge, both for the Panel members but also for us. And reflecting on the last couple of days I think there is an awful lot of work to do on both sides. Thanks Chris for this really interesting post. "not pepper them with a very long shopping list". Sorry, but 8 post-2015 SDGs or even 20 is not going to do it. It is not a "shopping list" but a comprehensive agenda of SDGs that we need, and if management is a problem then we need to tackle the management problem. We need an SDG Comprehensive Framework (SDG-CF). The SDG 900 proposal suggests 14 Goals, each comprising on average 8 Objectives, each comprising on average 8 Targets for a total of 900 Targets. Each Goal would have 1 priority main flagship Target (for a total of 14 flagship Targets) which would be highly publicised to make the UN SDG program more comprehensible to the general public. Goal 2. would include the 20 Aichi Targets even though their deadline is 2020.